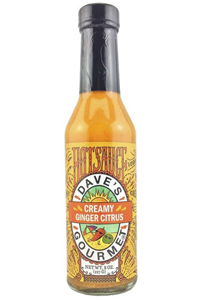 Dave's Gourmet Creamy Ginger Citrus Hot Sauce is made with red jalapeños, lime, and ginger combine to make one zesty flavorful hot sauce. Try a spoonful and experience the rich creamy texture followed by a hint of citrus and the zest of garlic and red jalapeños. This sauce is moderately spicy so you don't have to be a hot sauce lover to enjoy it. Ingredients: Water, red jalapenos, non-GMO canola oil, carrots, distilled white vinegar, onions, lime juice, slat, garlic, ginger, cumin, citric acid, and guar gum.